Those of you who know me well, know that I don’t cook (other than an occasional grilled cheese sandwich). So our small kitchen suits me fine. 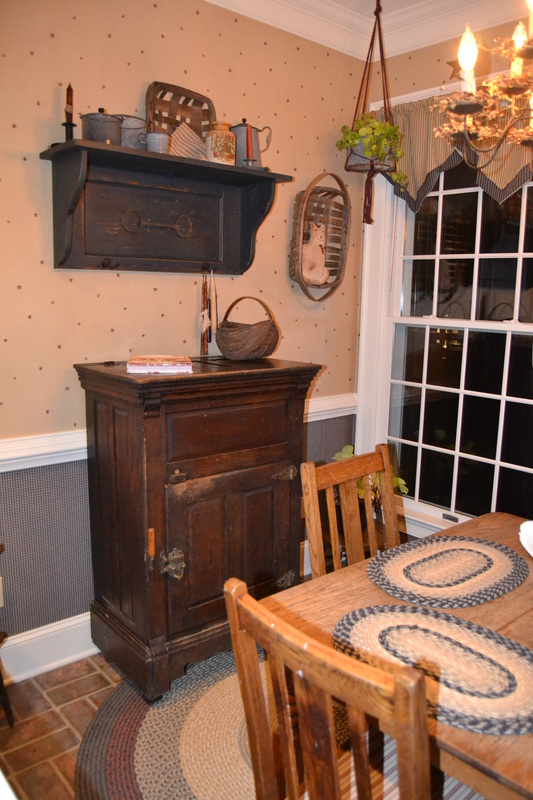 Here’s a little tour, beginning with the “breakfast nook” area. I apologize for the lighting in these photos. I wasn’t at home to take them yesterday, and found it difficult to get good pictures last night. 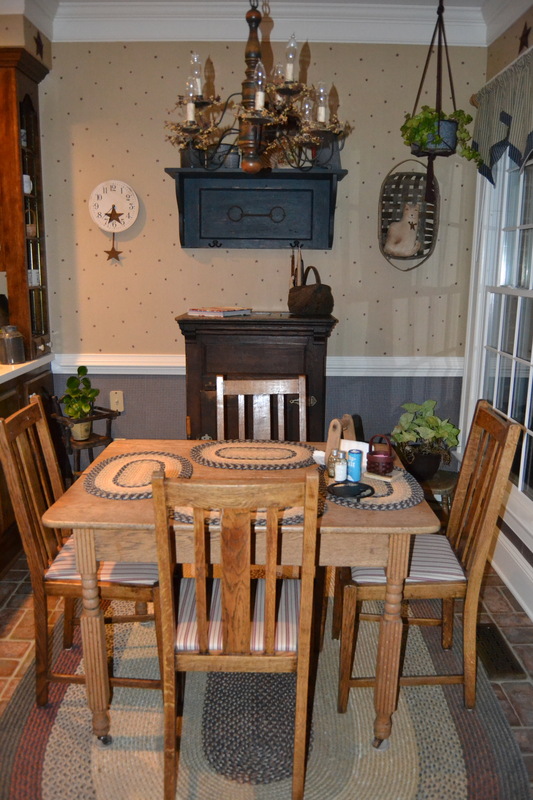 The wooden ice box beyond the table and chairs belonged to my aunt and uncle. You can’t tell from the picture, but that’s Pioneer Woman’s cookbook on top. Although the shelf above the ice box appears old, it was purchased at a craft show a few years ago. 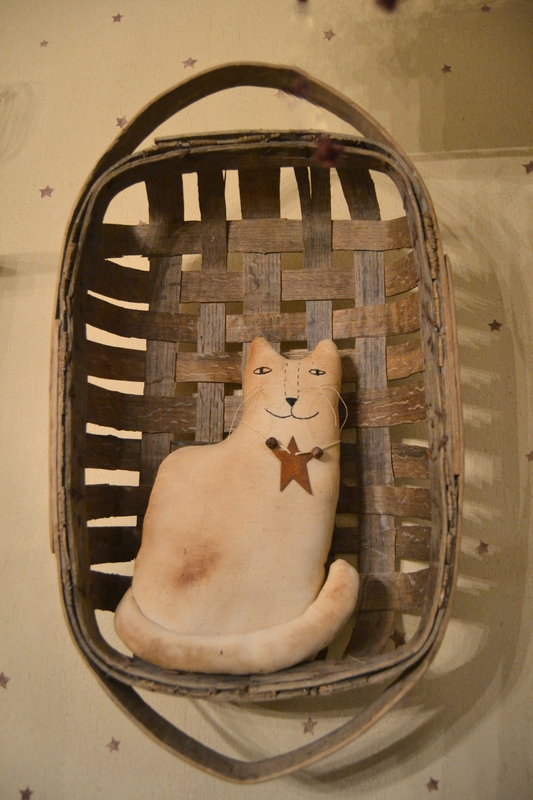 This basket is old, and the stuffed kitty was also purchased at a craft show. This is the doorway where I was standing when I took the second picture. Back when I was sewing, (instead of blogging), I made the piggy on the second shelf from a cloth bag that once contained smoked sausage links. 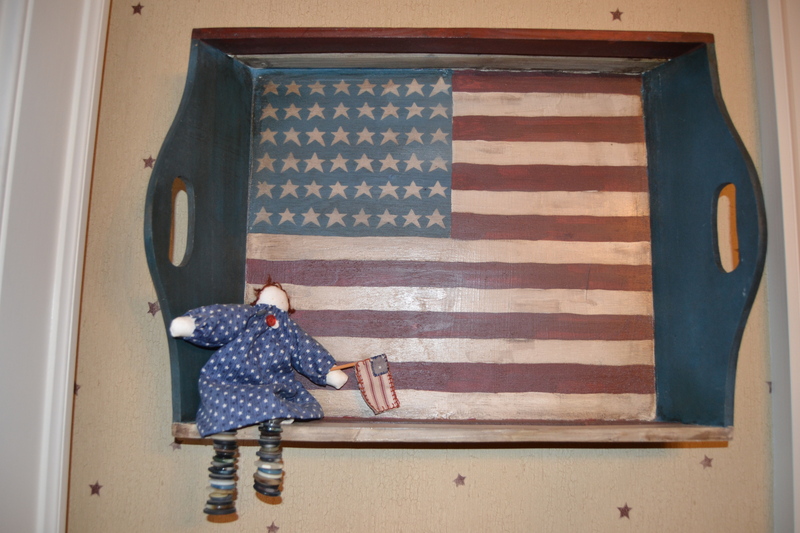 Many years ago (pre-blogging), I also made the little doll (and her flag) that’s resting on this tray. Her legs are made of buttons strung together. Here’s the “business” area of the kitchen. (We need to replace a light bulb, and I need to recycle the empty fish oil bottle that’s in the sink.) My friend, Doris, found the metal stars years ago and thought they’d be a nice addition to our kitchen. I agree. This entry was posted in Days at Home, Family, Sundae and tagged kitchen, mama kats, old wooden icebox, pioneer womans cookbook. Bookmark the permalink. Love your stars along the soffit (sp?). Your dolly with button legs is an inspiration. What to do with all the buttons in my button jar? Very cute kitchen, very “you”!! My favorite part, the floor, the colors and natural feel of it! I don’t love to cook, but I do enjoy cooking during the winter as I adore comfort food. When I’m “stuck” inside anyway, I do find it fun. Give it a try, it’s great when the house smells like home made love!! I’ll see what I can do about more tours…! Thanks! your kitchen is “small?” I would LOVE IT! It is sooo charming!!! And a kitty makes it that much better! Having seen this kitchen in person (!) I agree that it’s absolutely perfect in every way including the decorations and breakfast nook….not to mention all the very personal and creative touches by YOU! Sammy was pleased to see his girlcatfriend Sundae – he’s rather excited that she’s going to be his date for the Valentine’s Ball !! Dianna! I been reading a long time and NO! I didn’t know you don’t cook!!! How’d you work that out? I don’t like to cook.. 🙂 Well some things, but CH is a much better cook than me. Great prompt and I love all the things you made! Sundae’s little face watching you snap the picture of her cracks me up!! Love your kitchen/dining area. This was fun, Dianna; always love peeking in on a pretty kitchen. It’s a lovely place. 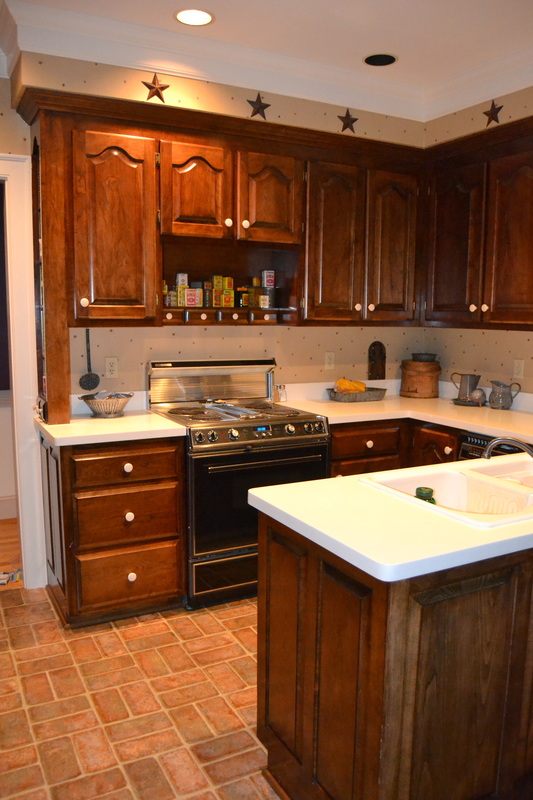 You know I absolutely love your kitchen and all the fun we had finding just the right touches. Sundae looks right at home. I like your kitchen. It reminds me of my Aunt Becky’s. Right down to the cool placemats. Your cabinets are gorgeous. And your kitty? Stop the truck! So sweet! Nice to meet you today. You have a cozy kitchen. All you need is tea and cookies! Somehow if I saw your beautiful kitchen in a magazine, I would think of you. It’s a beauty even if you don’t cook! 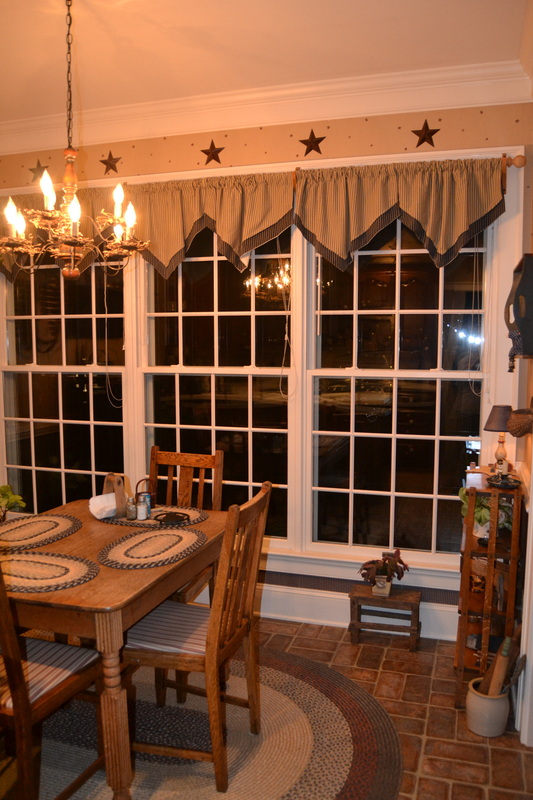 I am loving the country feel and look…so cozy!! Love, love, love your kitchen! So warm, homey, and inviting, even if you don’t cook much! 😉 Of course, the ‘stuffed’ kitty at the end of the tour was the best part. 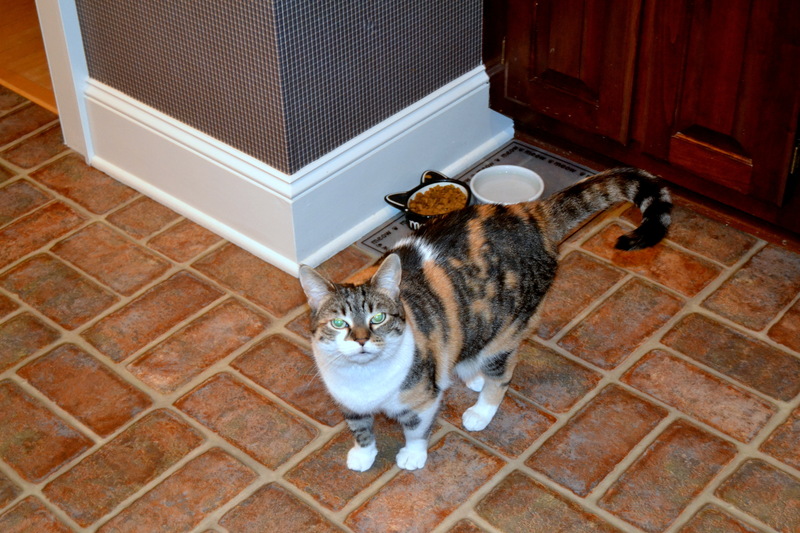 You have a pretty kitchen and your sweet little furbaby makes it even prettier! Very cute. I love your breakfast nook! Lovely kitchen, and that u shape seems great for cooking! Also Love the stars and your breakfast area. And your kitty definitely adds a certain something special to the room! I like those button legs. Your kitty is a cutie and I love the ears on her food dish. That really is a nice kitchen! 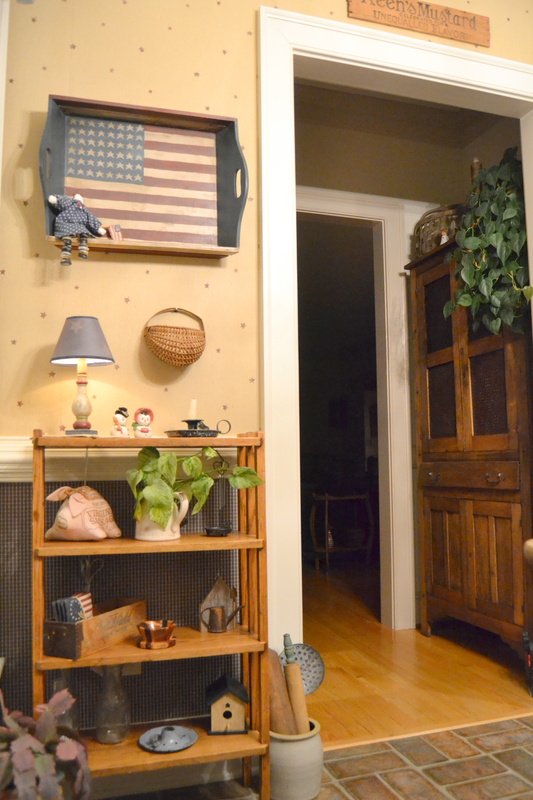 I love the breakfast nook, and of course, the stuffed kitty in the corner (ok, Sundae…sorry – you really are not stuffed! )…I could have done this one with some before and after photos, but couldn’t get my thoughts straight enough! Pretty kitchen. I like the braided placemats. Your kitchen is darling – and so welcoming. I wouldn’t have noticed the things you posted out (something in the sink) ’till you did! And Sundae, well she’s just the perfect accompaniment. um … *pointed* out … d’uh! I love you kitchen! I especially like the breakfast nook. It looks so inviting. Your home is so warm and inviting. I do like the decorative stars. Isn’t it amazing all the things we got done before blogging? No wonder you and Patti get along so well. You are both so “crafty.” I wish I were, but I haven’t a crafty bone in my body, unlike my daughter. I don’t know where she gets her talent, but it ain’t from her mama! I love the country feel. Lovely!